The smoke was so thick you really couldn’t see much at all in some areas. If you’ve watched the news during the last 10 days you might have seen that Southern Oregon is being inundated with wildfires and blowing smoke. I live in a small town in Southern Oregon and last Tuesday and Wednesday our pollution levels were listed at dangerous and critically dangerous levels. 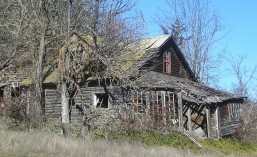 On Tuesday I had my appointment with my physical therapist in the small hamlet of Williams, Oregon. 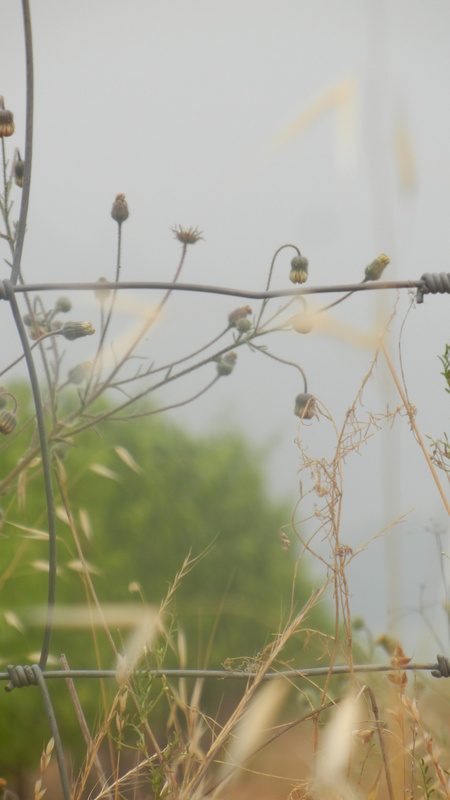 As I was driving home through the haze the little cemetery seemed to beckon to me. Based on some of the tombstones I saw, this final resting place is at least 150 years old. Pliasance Ranch is right next door. It is a very nice cattle ranch/winery! I have been there a couple of times, once to talk with the proprietors about a business idea and another time for their “Wine Down” end of the month music event. It was a hot muggy smoke laden valley I was traipsing around in. It made me sad to see so much smoke and know that many men and women were risking their lives to extinguish the various fires in this area as well as the loss of views and vistas that were sure to be evident when the fires finally are out. Yet, I could still appreciate the beauty that makes me love this land I have found myself living in. I knew that many of those that have been laid to rest here had seen fires in this land before and also saw regrowth and rebuilding. Interestingly, I found hope looking at the many headstones and even the new mound where someone had been buried maybe a day or two before. The following day, Wednesday, the smoke was dense and invasive everywhere we went. It was even hazy INSIDE the stores! It was making me anxious as well as giving me a headache. We decided to escape by heading to the coast and camping for a couple of nights. I hadn’t been to the beach for over a year. My last camping trip was 3 years ago, before my health changed so dramatically. I used to camp often with my kids, but hadn’t for so many years because it’s more effort and work than I can typically muster for recreation as well as sleeping in a tent is a challenge when you don’t always move well. I really wasn’t feeling well with the headache and my pain being in upper levels due to heat and stress. I offered to just stay home because I knew I wasn’t going to be much help in getting organized and packed for the trip. BH (my boyfriend) said he wanted me to go and so Thursday morning the packing began. I had no idea what he had for camping and I had given all my camping gear to my kids and brother over the last few years. I was going along for the ride and to get away from the smoke. I packed my own bag of things I knew I needed and I knew there was a blow up mattress to sleep on. I had made some chili the night before and put together a potato salad to take. We had a menu and both of us were working on getting the food together. We arrived at Indian Creek RV park in Gold Beach, Oregon around 2pm. We selected the tent site furthest from the road and it was right next to a creek. The guys started unloading things and the tent and mattress were ready in no time. I made the bed and down I went. The guys (BH and his son and friend) decided to go check out the beach. After a couple of hours rest I was feeling better. BH came back alone and said the boys were exploring. Did I want to take a drive and see some of the coastline? I was ready for that. We drove south to Cape Sebastian and parked and went for a stroll on the path. What gorgeous views we had both north and south. There was some fog rolling in and it was a bit windy. I enjoyed it all! I was with the man I love, enjoying our first trip together! We went and found the boys out on the jetty watching the whale (no one could get a good photo of that as it was too far out) and the sea lions. I made it part way out, sat on a rock, and enjoyed the scenery. I found this shell sitting as it is. I’m pretty sure someone did it, but it was neat to come across. BH and the boys preparing walking the shoreline. Friday morning I slept in. The guys were up and had their breakfast and headed out for some exploring. I took my time waking up. I used the nice showers and then went to the cafe for a late breakfast and coffee. It gave me some time to check my email and connect with my friends on Facebook. BH came back and said that the boys were doing their own thing. This is their last hurrah for summer as they both are senior football players and this week is the start of intense practices daily! I think dad would have liked to spend more time with them…but it is the way of teens to want to start the separation process and be with their buddies. He and I went for a walk to explore the trails leading to the river. There were lots of birds seen as well as many fishing boats out. The Rogue River at Indian Creek! Looking east. Today’s lunch menu was Zenner dogs and Taylor dogs. I enjoyed the first one. BH sautéed up some onions and peppers to top them off! The boys had tried the chili and said it was too hot. I sliced up a cantaloupe and we had more of the salad. It filled the belly. We had originally planned to have a bonfire out on the beach, but the wind had really picked up and it had cooled down considerably so we decided to hang out at camp. I had a few things to wash so I went to use the laundry facilities at the clubhouse. They were having a FREE potato bar for anyone at the campground to enjoy. I was going to sit and utilize the wash time for some writing time. I noticed an empty seat and asked the gentleman sitting in the next chair if the seat was taken. It wasn’t and he said to sit. He complimented me on my tie-dyed skirt and that was the beginning of a 45 minute conversation. We had grown up in the same town and his best friend is the oldest son of the family who lived across the street from my grandparents and whom I am still friends with. Small world! My guy came down and had a potato and we all had a great talk. The boys showed up and we decided to stay indoors for a while and utilize the amenities. We played ping-pong and pool. BH and I taught the boys some of the finer points of shooting pool such as…NO SLOP!!! They weren’t totally buying what we were telling them until some others who were playing on another table chimed in and agreed with us. Ahhh..the ways of teens. It makes so much more of an impact when they are told something like that from someone other than a parent (or their girlfriend). We spent maybe an hour by the campfire talking about bucket lists, favorite cars, what we would do with a million dollars and all types of things. It was a nice ending to an enjoyable day. When we awoke and started having breakfast I asked if there was a reason we had to go home. I was really enjoying myself. I also really enjoyed this wonderful campground. I highly recommend it. The other boy with us said he was expected home, so that was the answer. I packed up my things and cleaned up the inside of our tent and deflated and loaded up the mattresses after having a nice hot shower. I left the guys to finish packing and loading while I enjoyed my coffee. We do so many things differently it seemed to me the wise choice to leave them to it. I knew I would have plenty of clean up work when we arrived home…with laundry and putting things away! The ride home was uneventful. We only made a couple stops on the way home. One for the boys to get snacks and drinks, one at a nice beach to take a few photos and one at a campground we were checking out for another trip. We started noticing the smoke about 25 miles inland. By the time we reached town we could tell it was better than when we had left, but still pervasive and invasive. I think we are going to be stuck with this for a while. 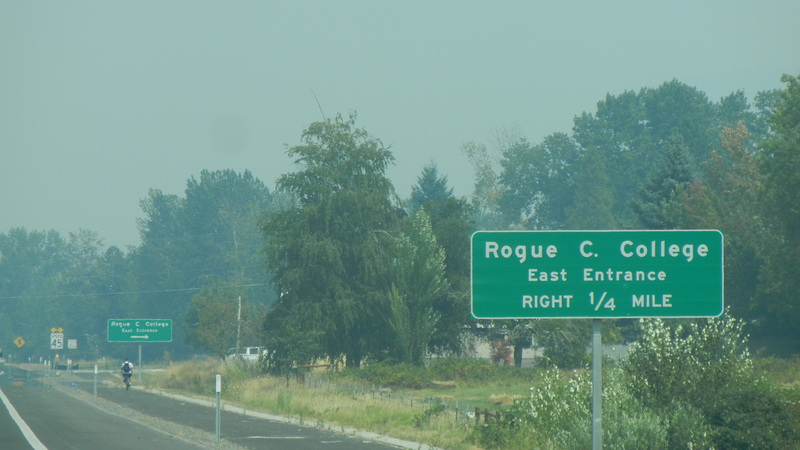 We have arrived back in Grants Pass…to the smoke. Maybe we’ll have to take another trip in a couple of weeks to get away from it. I’ll use that as an excuse to travel a bit! Even with the smoke, I am glad to live in Oregon. The weekend before I had been up the McKenzie River at a lovely retreat center. Where else but the Pacific Northwest can you travel an hour or so east and be in the mountains and an hour or so west and hit the ocean? We also can get to beautiful deserts with a few hours of driving. Today..the smoke is not too bad yet that could change in an hours time. We saw it happen yesterday. It wasn’t too bad early in the afternoon. It was starting to get more smoky when we went out to get a few groceries. In less than 30 minutes inside the store, the smoke had begun to permeate into the building and the smell had become very strong. I pray the fires get put out soon. I pray for the brave men and women fighting them. I pray for those that have homes and property in the way. I pray for all the wildlife being affected. It’s hard to convey how bad it is. Some have described it as “apocalyptic”. I just know I don’t like it at all and will be grateful beyond words when it is gone!